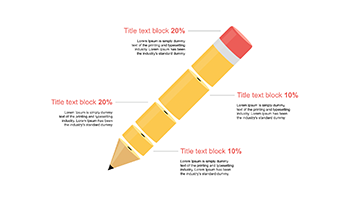 4 Levels Pencil Concept for PowerPoint - Download Free Now! What is the slide with 4 levels pencil concept for PowerPoint for? Our site is a great library of premade professional templates for sites and presentations. We offer a large variety of charts, diagrams, schemes, and other infographics. 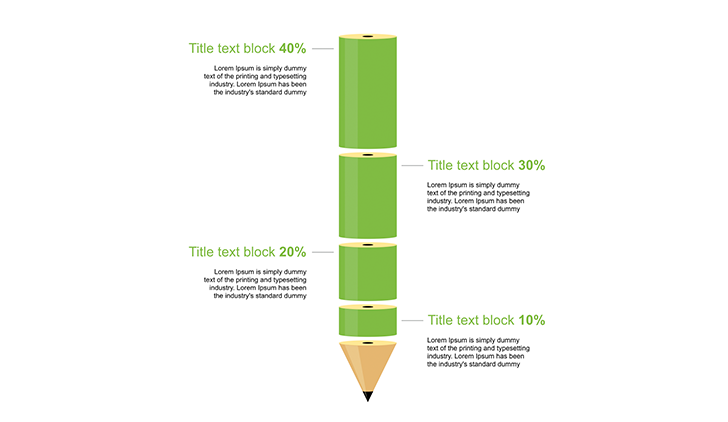 On this page, we display the slide with 4 levels pencil concept for PowerPoint. It is one unique pencil cut into four segments that correspond to the percentage. 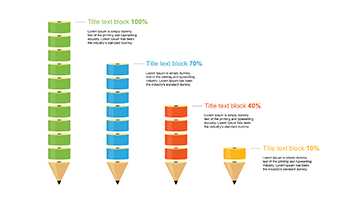 The text blocks provided to every segment indicate the percentage and the parts of the pencil visualize these data. Infographics is a graphical way of displaying information. Using such tools, you can convert parts of the text into graphical images, elements, charts. It is clear that less paragraphs – perception is easier. This is especially important when it comes to a large number of figures, facts, and dates. And statistics is always boring and complicated. No more than 2-3 figures or dates per paragraph, otherwise the text will be too difficult to comprehend. You’ll find this advice in many textbooks for journalists and copywriters. But there are topics or questions where it is impossible to avoid dates or figures. That’s where the infographics come to help! And choosing our elements, you’ll get not only a professional tool but also a convenient assistant for work. High quality. Professional high-quality templates always demonstrate your competence and create a good impression. Thus, we offer only approved high-quality elements for your projects, which won’t have any visible defects. This slide with a pencil will be perfect when you display it on any screens regardless of their resolution. Built-in tools. This pencil is of green color, but it’s up to you what color design is to choose. Due to the built-in tools, you can edit this infographic template to your taste. Multipurpose element. This template is designed to display statistics; therefore, it can be used in various business presentations, marketing reports and other projects where it is necessary to visually represent statistical data. Easy-to-use ready-made slide. 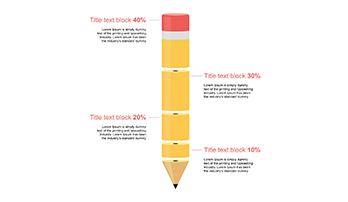 This template with 4 levels pencil concept for PowerPoint allows spending less time for your responsibilities and making the working process easier. The slide will be easy for understanding even for beginning users who do not have additional computer skills.